For those aching to satisfy hunger pains past midnight, the options aren’t unlimited. Taquitos at 7-Eleven? Those suckers have been rolling on those silver turners since you stopped for a midday snack. Dollar-menu items at McDonald’s at 3137 N. Broad St.? By the time you’re ready for a late-night treat, the Golden Arches only allow you to supersize your fries, burger and your behind. Here are the places you can count on, no matter what time it is and no matter what kind of craving you have. Temple Garden at 1524 N. Broad St. is open until 2 a.m. Sunday-Thursday and till 3:30 a.m. Friday and Saturday. At 1412 N. Diamond St., Temple Star is open until 3 a.m. Monday-Thursday, till 4 a.m. Friday and Saturday and till 2 a.m. Sundays. Both deliver until close. 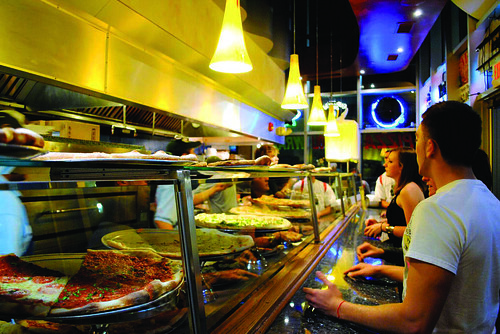 Students craving buffalo bites or one of 15 kinds of pizza can visit Maxi’s Pizza, Subs and Bar until 2 a.m. Monday-Wednesday and until 4 a.m. Thursday-Saturday. Insomnia Cookies, located on Montgomery Street between 12th and 13th streets, is open until 2 a.m., and the smell of its cookies baking spans the entire block. It delivers three kinds of cupcakes, 13 kinds of cookies and 14-inch cookie cakes straight to your door. The minimum for delivery is $6. There is an additional 99-cent delivery fee, and though the wait may be between 30 and 45 minutes, it’s worth it for the gooey wonders. Students who are older than 21 and crave a juicy, non-McDonald’s-inspired burger can visit the Draught Horse, at 1431 Cecil B. Moore Ave. The pub is open until 11 p.m. on Monday and Tuesday and closes at 2 a.m. Wednesday-Saturday. Jamaican D’s opened a truck in front of the engineering building. Don’t let your co-workers get you down – make the most of your lunch break. Baker Dave teaches a series of courses at Tyler for students to learn food-based art.